I really want to thank you for comments on my last post about my stolen camera. You made me feel so much better with all your cheer, support and suggestions. You are the best pep squad a girl could ask for! I went out yesterday and bought a new camera, a Nikon D90. I NEED to have a camera. Here’s my rationale for making myself feel better. I had my D40, plus lens for over a year and a half. If I break it down, I paid $2 per day for that camera. What a deal!! All that happiness and preserved memories for less than a cup of hot chocolate. Rather than stay with the same level of camera, I felt I should upgrade now and really continue to push myself to become better with my photography. Screw you, camera thief! These are some of the first photos taken with my new camera. First impression – LOVE IT. 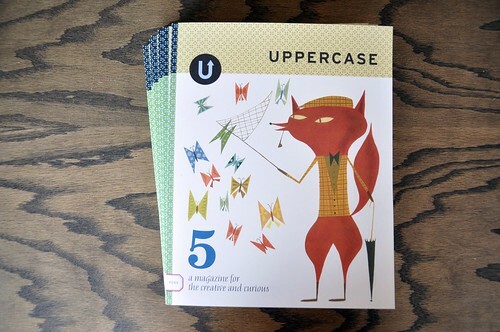 We received a large shipment of the latest issue of Uppercase Magazine. 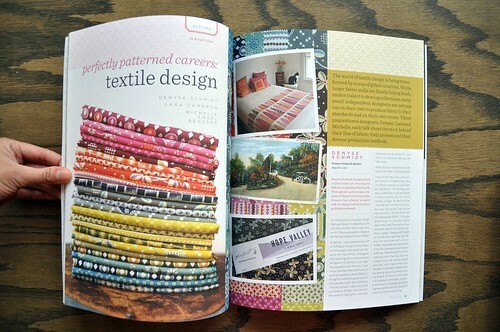 I was absolutely honoured that Janine asked me to participate in this issue by writing an article on textile design. I interviewed three incredible ladies who have inspired me with their pattern design and successful careers. Denyse Schmidt, Lara Cameron and Michelle Engel Bencsko were kind enough to tell me all about their working process. Their answers were totally fascinating. I hope you enjoy reading it. The entire issue is jam packed with wonderful features, including cover art by Matte Stephens. 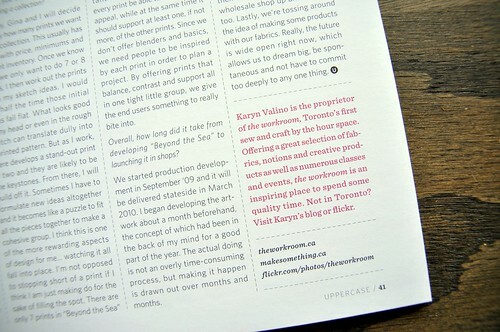 Uppercase just gets better with each issue. 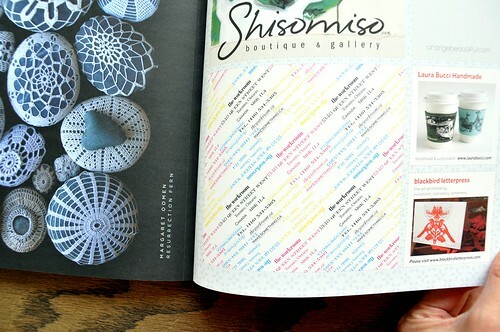 You’ll also notice the workroom’s first print ad (whoo!) at the back of the magazine, designed by Andrew. images are so nice and crisp, I too will be looking for a new camera soon! I can definitely sympathize, as I had a digital camera stolen a few years ago and still mourn the loss of the images that went with it! 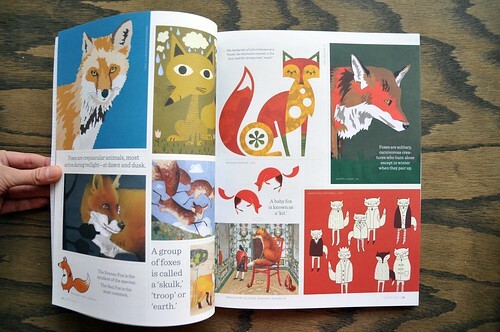 On the bright side, your pics are great and I am looking forward to getting myself a copy of Uppercase. I hope you haven’t totally lost your faith in humankind, but I know mine was shaken quite a bit at the time of my loss. I hate to think that people can’t be trusted to keep their paws off things that don’t belong to them! Yaya, now we are camera sisters! i know you will continue taking beautiful pictures with your new camera! i am looking forward to picking up a copy hopefully today!!! Looks like your new camera is going to take some beautiful pictures Karyn! Congrats on getting it and you’re right – screw you camera thief! Erica (of EricaKnits) and I are very jealous of your new camera; we went to High Park today to take pictures of the cherry blossoms and I can tell you I would have loved to have had a camera like yours with me! Also, congrats on the article! That is absolutely amazing that you got to interview so a talented group of women; I’m definitely going to have to read it! I’m hoping to make it out to the truck show on Sunday, so hopefully I will see you then! Wow! I can’t believe people have such nerve! I hope they are feeling endless guilt! I’m sure your new camera will be just as good to you. I too am envious! I also went to High Park today to check out the blossoms and my point and shoot could only do so much! Karyn, thanks for writing a really great article! I still can’t get over the fact that Denyse Schmidt is in the magazine; she’s been a design/entrepreneur heroine of mine for so long. I look forward to our next collaboration. I just got a d90 and I looooove it, too. Sorry about what happened to your old one, but your attitude about the whole situation is inspiring. I can’t wait to read your article and I also am so delighted to be a little part of this issue.
! great news about your interviews in Uppercase 5 ! davis – this camera is pretty great. there is a lot more control and features than my last camera. let me know if you want to check mine out before you buy yours. janet – it’s true, i miss the photos the most. luckily there wasn’t anything monumental on the camera, so that’s a relief. it’s still hard to get over the feeling that people like that have no problem taking stuff that’s not theirs in broad daylight! tina – we’ll have to introduce our cameras to each other! kaye – i went to see the cherry blossoms last night, so pretty. i feel really privileged to have had the opportunity to do this article. i admire these three women so much! monique – i must admit i am falling in love with this new camera. i’m also determined to learn to use it to it’s full capabilities, so i’m slowly working my way through the manual. michelle – you’re right, it is a business expense for sure. unfortunately, not one i had budgeted for. oh well! and btw i didn’t get a chance to talk to you on sunday at the trunk show, but i just love your new haircut! janine – oh no, THANK YOU! it’s was so much fun for me to take part in your amazing publication. i look forward to lots of collaborations with you in the future. hope you and the little baby are doing well! joanna – thank you! i’m trying to be very positive about the whole experience. hope you’re enjoying your new d90 as much as i am. margie – there’s always a bright side, right? i was thrilled to see your lovely photographs in the issue. they look so striking! viv – thanks! i hope you enjoy the copy that you picked up on Sunday.